The “saved” fire station at Kibworth Beauchamp is now looking for new recruits. Kibworth Fire Station’s watch manager Steve Hare says he wants at least six more people to bring his fire and rescue service team back up to full strength. The village fire station had been threatened with closure in a planned re-organisation by Leicestershire Fire and Rescue Service. But a big campaign by local people was amongst the factors that forced a re-think. 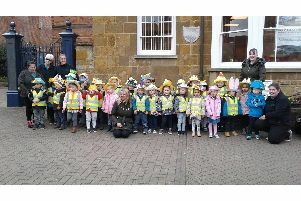 Typical was the opposition from Harborough District councillor and former firefighter Roger Dunton who said the planned closure would “put lives at risk”. Fire authority chairman Cllr Nick Rushton has now outlined new plans for the service which do not involve any fire stations shutting. He said that “well co-ordinated” public pressure against the original plans had been a deciding factor. “I’m over the moon” said Steve Hare this week. “I can only thank the people of Kibworth, local villages and beyond who campaigned against this closure. The shadow hanging over the station meant that Steve had to put a hold on recruiting any new staff. But he said he was now looking for at least six people; men and women aged over 18, with a reasonable level of fitness, who lived within five minutes of the fire station. The new recruits would be retained firefighters who keep their normal jobs but can be “on call” for at least some of the week, in case of emergencies.